When Jen was pregnant with her first two babies she decided to keep their gender a surprise until delivery day. 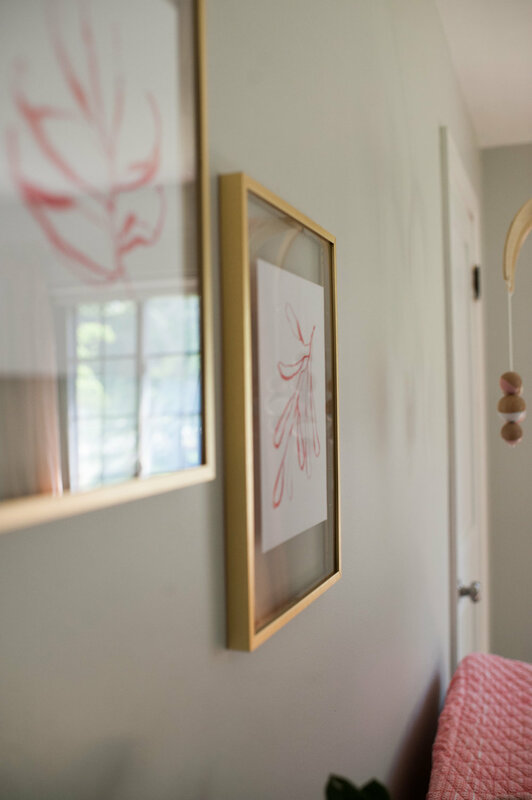 When she found herself pregnant with her third, her family was in the midst of a major move and total renovation of their newly acquired 1930’s bungalow. As expected, huge transitions come with big emotions and waiting to find out Mabel’s gender just wasn't going to happen this time around. Plus….third baby. 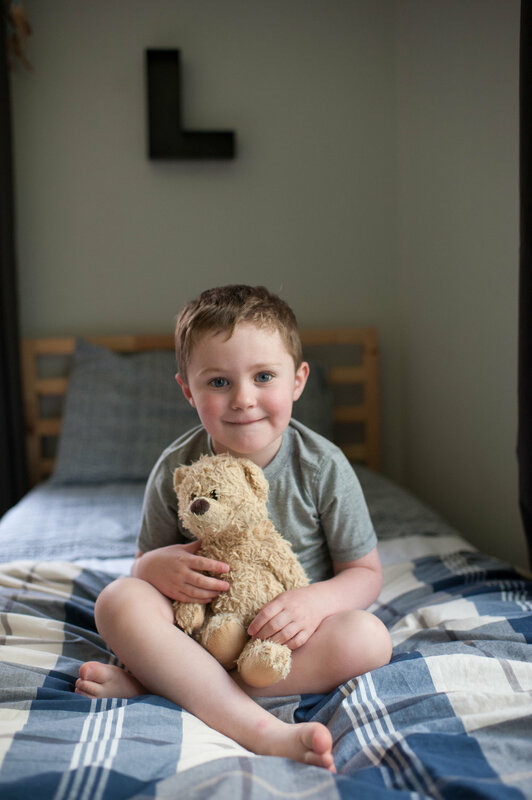 At the infamous twenty week ultrasound their boy streak was broken and the Walker family found out they would welcome a sweet baby girl into their hearts and home. And…..a whole lotta pink. When Jen moved into her home she was so excited to find that peonies were blooming all over her new yard. 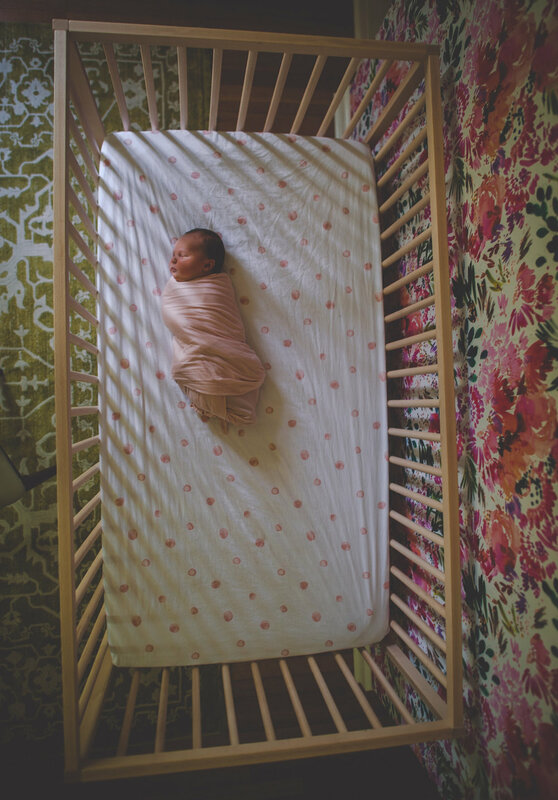 Together, with her sister Kelly, they designed and styled Baby Girl's nursery around these bright happy florals that lined the perimeter of her house. 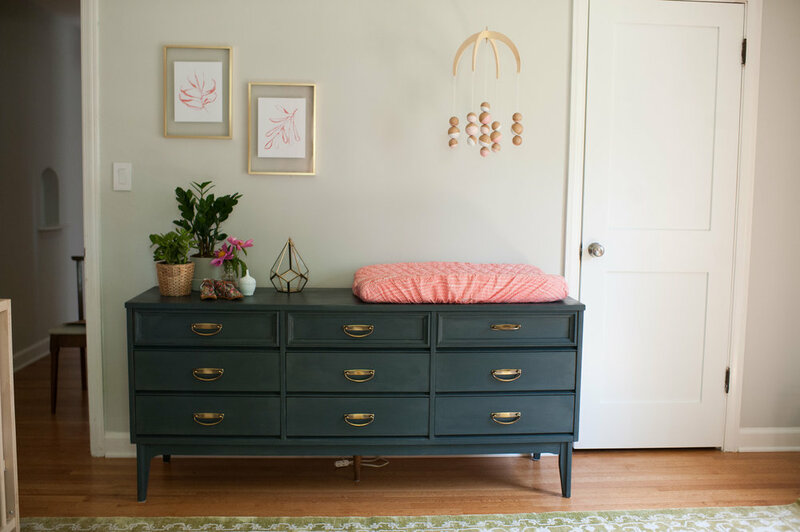 The gorgeous Kelly Ventura Design wallpaper paired with the vintage reclaimed dresser and luxe velvet rocker truly brought their inspiration to life….it feels sophisticated yet is still so playful; just so perfect for a little girl's room. Okay friends, bring on the pretty pictures courtesy of the uber talented Elaine Melko. No, not really. 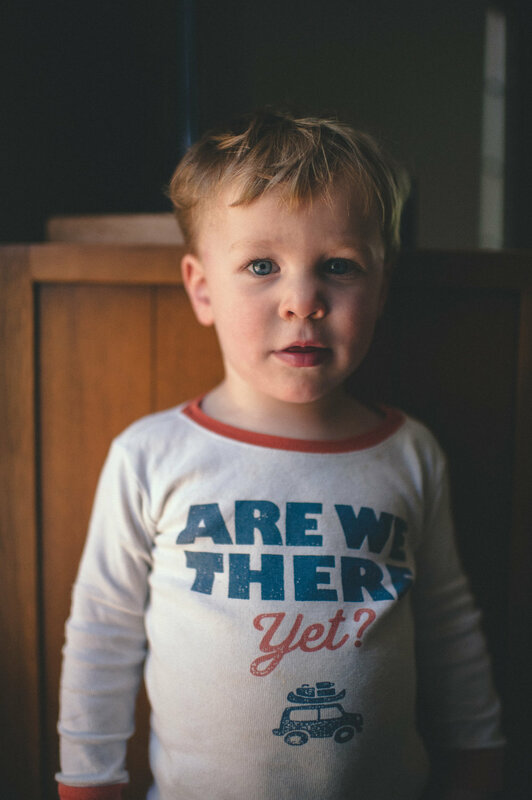 We have our own website and we just really love babies and fresh designs and things that aren’t planes, trains and strawberries. 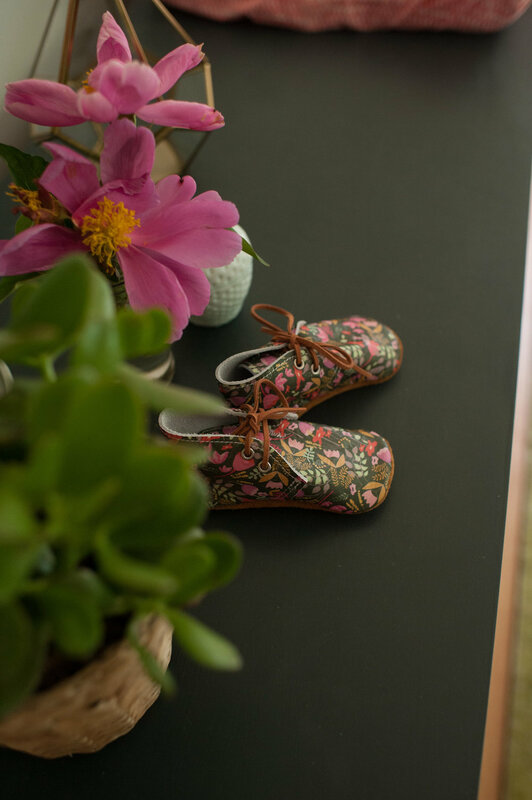 Actually, we do love planes, trains and strawberries but felt very strongly that the moms of the world were in need of patterns that could grow with their kids, aesthetically fit in with the vibe of their homes and, well, just look a little less baby. Also, we were two corporate gals turned stay at home moms and we were going just a tiny bit crazy. Every mom takes a different path and we chose to stay home when we had our first babies nearly five years ago. And as much as we knew in our hearts it was the right decision for us and our families, we were both deeply craving an outlet for our minds that had everything to do with us and nothing to do with our adorable offspring. Does that sound selfish? If I’m being perfectly honest, we weren’t super happy staying home with our (at the time) four sweet, wild, sword fighting little boys. Yet, we also did not want to stop being home with those same boys. I mean, look at their little faces. Hello, vicious cycle. Jen was living in Atlanta when the concept of Petite Haven started to form. We talked nearly every day about what we could do. 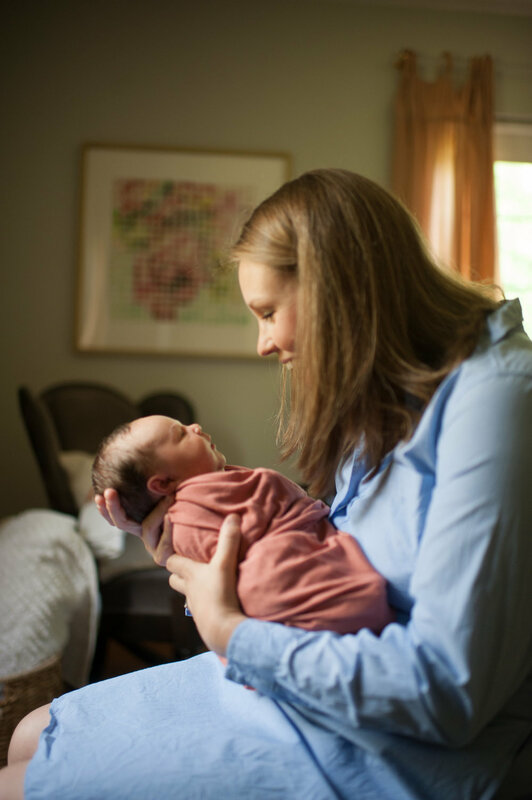 At first we were going to start a blog about crafts and meal plans and all the things that go along with motherhood. We quickly realized that I am not crafty in the slightest and although I do like cooking for my family I have also been known to make this. It’s from Costco, you microwave it for 8 minutes and everyone thinks you're the next Giada De Laurentiis….you’re welcome. Alright, blog officially scrapped. We’ve always been drawn to Kelly’s art and felt VERY strongly that it needed to be on The Babies. Our product needed to be something functional, something that as moms, we used every day. 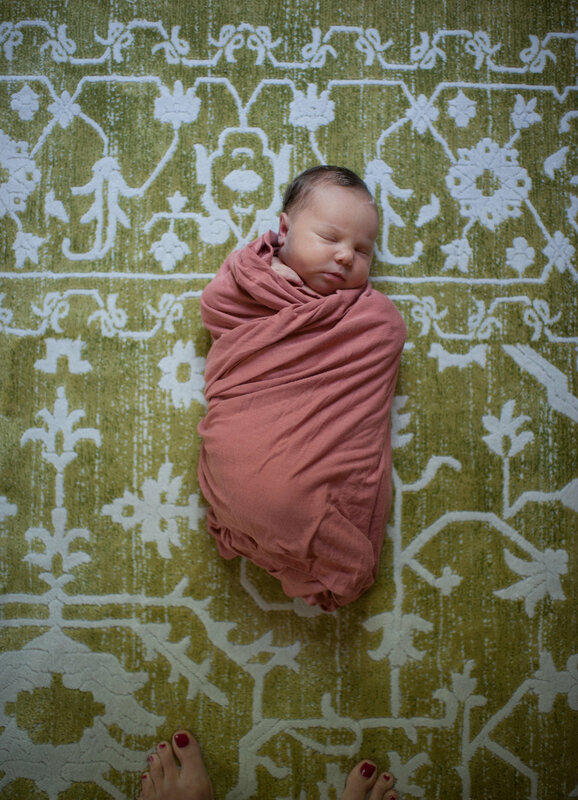 Yes, her patterns obviously needed to be on blankets and swaddles. We want to be really transparent here - Kelly is Jen’s sister and my dear friend. We grew up together and have been Kelly’s cheerleaders ever since she held her first art gallery sale in her basement many moons ago. We are just so proud of her and find her to be a true inspiration as a female entrepreneur. She's a mom to three adorable boys, has a zipline in her backyard and tolerates all of our ridiculous questions. Therefore, she's the coolest. As soon as our idea came to life we instantly went to work. 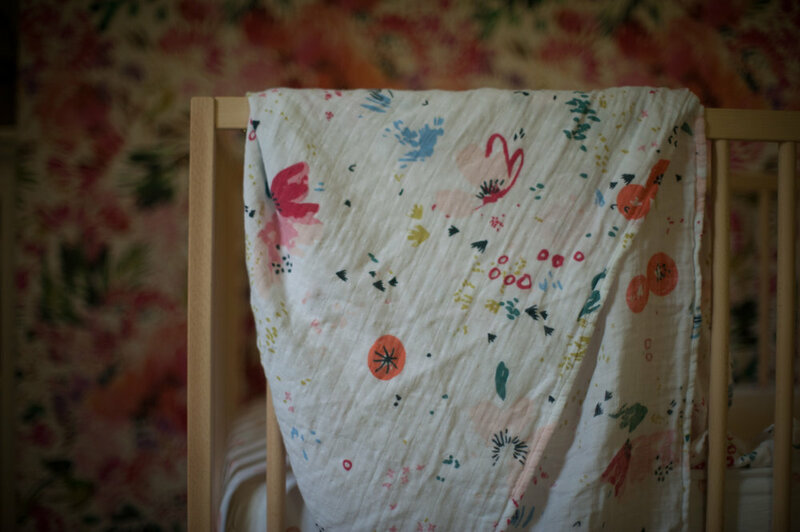 We sampled ALL the cottons, and ultimately decided on the one we believed to be the absolute softest. Another sticking point for us was that we didn’t want you guys to be able to feel the printing. You know what we mean…..where you can almost scratch off the ink? Yeah, none of that over here. Two years later, we launched! It’s a scary thing, right? Putting yourself out there to possibly fail. Last winter, I had been really dragging my feet on making the decision to go all in on the investment in Petite Haven. My mom looked at me so seriously and said “Katharine, your life is going on no matter what.” She was so right (surprise, surprise). I just needed to take the leap and see where it would take us. The past two years have brought a major move and house renovation for Jen and two more babies between the two of us. Meet Claire and Mabel.